Oriental white storks (Konotori) at the Konotori-no Sato Park, or the shelter and research center of the oriental white stork, in Toyooka, Hyogo Prefecture. The bird, which has a wingspan of two metres and is officially designated a national treasure in Japan, became extinct in the country in 1971. 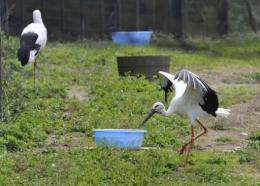 Four decades ago the oriental white stork became extinct in Japan, the victim of rapid industrialisation and modern farm practices and heavy pesticide use that destroyed its habitat. Today, the graceful migratory bird soars again over restored wetlands around the small town of Toyooka in western Japan, now a showcase for an ambitious conservation effort called the Satoyama Initiative. As Japan hosts a UN conference on biodiversity this week, the high-tech nation is pushing the initiative to promote some of its ancient village wisdom as a way to heal battered environments worldwide. The initiative draws lessons from before Japan became studded with megacities and crisscrossed by bullet train lines, when most people lived in villages near rice paddies, bamboo groves and forests. In the pre-industrial age, woodlands gave villagers plants, nuts, mushrooms and wildlife as well as natural medicines, textiles, fuel and timber for building, all usually harvested sustainably over the centuries. These managed ecosystems -- neither pristine wilderness nor cultivated agricultural landscapes -- are known as "satoyama", a composite of the words for villages (sato) and mountains, woods and grasslands (yama). Today ecologists, somewhat less poetically, call them "socio-ecological production landscapes". At the 193-member UN meeting in Nagoya aimed at stemming the loss of plant and animal species, Japan is seeking to sign up groups and countries to exchange conservation lessons and ideas through its Satoyama Initiative. Japan's centre-left Prime Minister Naoto Kan on Wednesday announced two billion dollars in aid over three years to help poor countries preserve biodiversity, including through the initiative. "The government of Japan will utilise the wisdom of such traditions, combined with the technology and experience nurtured in our country, to provide assistance to developing countries," Kan said. In Japan, as elsewhere, the human-influenced natural environments called satoyama have been on the decline as many forests have vanished, agriculture has become modernised, and small farm villages have been abandoned. 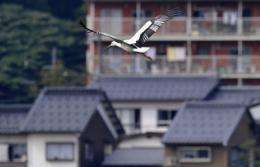 Bucking the trend has been Toyooka, a town of about 90,000 people in the west of Honshu island, which prides itself on undoing much of the past damage that had wiped out the oriental white stork. The bird, which has a wingspan of two metres and is officially designated a national treasure in Japan, became extinct in the country in 1971. Local farmer Tetsuro Inaba, 68, remembers how when he was a child the birds were still a common sight across the country, before they slowly vanished, with the heavy use of pesticides delivering the final blow. Graphic on the reintroduction programme of the oriental white stork to the Japanese town of Toyooka. Now, about 50 storks live in local wetlands and fields and 100 in a public park in Toyooka, a fact that the city proudly promotes to attract tourists. "When I took over the farm from my father, the farmers here were addicted to pesticides. In hindsight, we used terrifying amounts," he said. When wild stork numbers in Toyooka fell to just 12 in 1965, the city caught a pair and started an artificial breeding programme. But the conservation attempt failed, and the rest died out in the wild. "They had lost their reproductive capacity because of the mercury that had accumulated inside their bodies from pesticides," says Inaba. In 1992, Inaba became a community leader, determined to "live with the storks" -- a species that survived in parts of Russia, China and Korea. Inaba and other farmers studied how to grow rice without pesticides. They also rebuilt waterways and flooded some rice fields for longer or all year-round to bring back fish and frogs that are food sources for the storks. "When I learnt that frogs eat noxious insects, I was very moved. I said to myself 'we can do farming without pesticides'," said Inaba. As the local habitats slowly recovered, Toyooka released storks into the wild five years ago. They had been bred in captivity from six young birds donated by Russia's far-eastern city of Khabarovsk two decades earlier. Now, about 50 storks live in local wetlands and fields and 100 in a public park in Toyooka, a fact that the city proudly promotes to attract tourists. The birds have become the emblem of the local brand of "Stork-Nurturing Rice", popular with ecologically-minded consumers who can order it online. Inaba said growing organic rice is more challenging than it was when farmers doused fields in pesticides, but said he was determined never to go back. "I want to pass on the landscape that I saw as a child," said Inaba. "I hope our efforts here will spread to the rest of the country."